I’m on a bit of a rant at the moment. So if you are not in the mood for one of those, I’ll excuse you. Go and have a coffee, or tea, or whatever. What a horrific mess. I really pity the poor graphic designers who have to work on this kind of mind numbingly turgid stuff, a collision of typographic and photographic garbage. Imagine spending three years hard graft at art college dreaming the dreams and longing for that day when you can join a decent design company. But you don’t, instead you end up working on one of the above titles. Yes, I know it’s a job in these difficult economic times, but is it going to improve the standard of design? Looking at that array of sub mediocrity, I was not only struck by identical appearance, but the banal headlines - ‘Katie in crisis’. ‘Cheryl’s nightmare’ etc, etc. I of course realise that these magazines are part of the bigger ‘celebrity’-selling selling machine. Stories, photographs and events are manufactured and stage managed to promote the ever increasing number of vacuous ‘E’ and ‘D’ listers to the public eye in order to extract their ever diminishing hard eared cash. As PT Barnum once said, ‘No one went broke underestimating public taste.’ These stories promote books (mostly ghost written), TV shows, films, CDs and tours. They are a commercial deal between celebrity agents, their PR firms with news papers, magazines, publishers, film and TV companies. But the ever-gullible magazine reading audience seems to accept it hook line and sinker. The target is fed the bait and groomed at a very young age to take this stuff seriously. Not much elbowroom for the designer there then. I happened to hear Damon Albarn on the Radio 4 the other day. He was attacking X Factor style shows, with their cosmetically enhanced judges strutting for attention. Albarn referred to these shows as ‘Karaoke Coliseums’- a perfect description I think. He went on to lament the passing of ‘Top of the Pops’ which he felt was a far more democratic way to explore a whole range of musical styles than the extremely narrow path of ‘Emperor Cowell’s homogenise, predictable product. We have to endure increasingly pompous and egotistical business entrepreneurs and D list entertainers spouting their banal and well-rehearsed opinions. In the process they too are elevated to ‘celebrity ’ status and become yet more fodder for the magazines racks. I find it all deeply depressing and thank God for the safe haven of BBC Four, the one lone TV channel that treats its audience with some modicum of intelligence by producing and broadcasting thought provoking, engaging, inspiring and stimulating programmes. I am happy to pay my TV license fee just to support that channel, along with BBC Radio 3 and 4. But with the BBC under increasing economic pressure, nothing is safe. I am fearful that BBC television is on course for a slow disintegration into the bland predictability of the Sky stable and all those other sub standard satellite channels. And yes, I know what you’re thinking - grumpy old man! – well, I guess I am. However, when the remaining vestige of quality television has gone, we will all be the poorer for it. Quality breeds quality. Crap creates yet more crap. and quickly developed an admiring audience, will no longer be associated with the BBC. HBO have got a better deal for the next series with, yes, you guest the purveyors of garbage, Sky. They let others take the risks and then mop up the rewards. I don’t think you’d like it, would you? I bumped into Arnold Schwartzman a few weeks back - coincidentally there was a new six-part series on Channel 4, ‘How TV Changed Britain’ which explores the impact television has had on the culture of Britain. This week it centered on programming for ‘young people’ (stay with me, it’ll make sense by the end) and how television had to adapt to social change, as teenagers became increasingly demanding and relevant – No more boring grown ups sitting behind desks deliberating about the latest hits and misses,e.g.‘Juke Box Jury’. Enter the super cool’ Ready, Steady, Go!’ – Cut back to Arnold. At the time he was working at the then TV station, Associated Redifussion, and was responsible for all the graphics, including the title sequence. 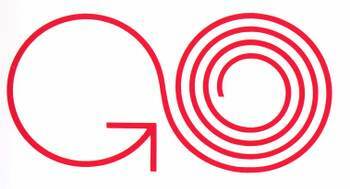 Below is his logo for the programme - still very nice too after 44 years. As is the photo of Arnold with ‘Ready, Steady, Go! Presenter, Cathy (Queen of the Mods) McGowan, taken around 1964. Arnold went on to work for Saul Bass in the US. Then set up on his own and promptly won an Oscar. He lives in LA producing books on architectural design details and is very involved with the documentary side of the Academy of Motion Picture Arts and Sciences and BAFTA/LA. In between all that he sits around the pool drinking Martini’s. Nice to see the logo, looking so good after all these years. 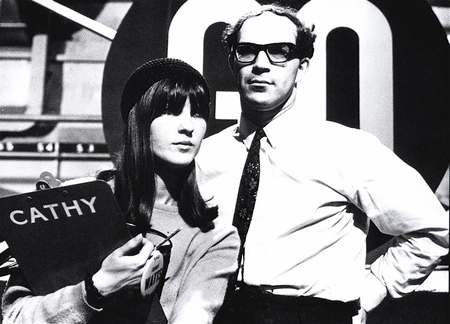 Cathy McGowan and Arnold Schwartzman (note the Harry Palmer specs) on the set of Ready, Steady Go!' 1964. To here a recorded interview that I made with Arnold click here. The logo, looking good after all these years.